This week’s book will definitely help you increase your protein intake. Pip & Nut: The Nut Butter Cookbook is written by Pip Murray, founder of Pip & Nut, a natural nut butter brand. I’ve picked out two desserts for you to try this week. Nut butter is a high-protein option and tastes fantastic. So break out the baking tins! Roll out the pastry to 5mm thick and use to line a 25cm tart tin. Line with baking parchment, fill with baking beans or dry rice and blind bake in the oven for 10-15 minutes. Remove the beans and parchment and bake for another 15 minutes, until it starts to turn golden brown. Set aside to cool. Bring the cream, sugar and salt to the boil in a heavy-based pan. As soon as the cream starts to boil vigorously, take off the heat and add the butter, chocolate and espresso powder. When the chocolate and butter have melted, stir in the milk, transfer the mixture to a jug and pour into the cooled pastry case, filling it right up to the rim but being careful not to let it overflow. Using a small teaspoon, place small blobs of almond butter in rows running from one side of the pastry to the other. Using a wooden skewer, run through each blob to make a marbled effect. Leave to set for a few hours. Serve it cold with some double cream. Whisk the peanut or almond butter and milk together in a heavy-based saucepan over a low heat. Meanwhile, in a bowl, beat the sugar and egg yolks together until pale and thick. Stir the hot milk and nut butter mixture into the eggs and sugar to combine, then pour the mixture back into the pan. Cook, stirring all the time over a low heat and making sure it doesn’t boil, until it starts to thicken and coats the back of a wooden spoon. Pour into a bowl and leave to cool, then chill. Whip the cream to soft peaks and fold into the chilled custard mixture. Churn in an ice-cream machine, according to the manufacturer’s instructions, then freeze for an hour. Take the ice cream out of the freezer to soften. To make the chocolate hazelnut sauce, put all the ingredients except the pretzels into a heavy-based pan and melt together over a low heat, stirring occasionally. Crush the pretzels in a food bag, using a rolling pin, saving a whole one for decoration. 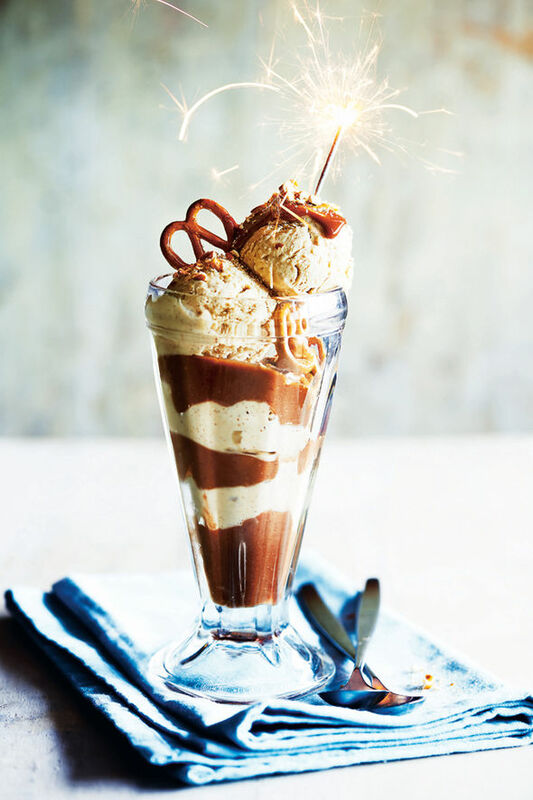 Using a tall ice cream glass, put a scoop of ice cream in the bottom, then sprinkle with pretzel crumbs and then the chocolate hazelnut sauce. Repeat and finish with the final scoop of ice cream. Top with the reserved whole pretzel and serve.